Equities in Europe and futures on the , and slipped lower this morning, though U.S. contracts later managed to crawl back above neutral levels amid a general lack of market drivers. The wiped out Fridays’ gains after the open—even after Shell (LON:) and BP (LON:) edged higher as prices advanced for the fifth straight day. Rio Tinto (LON:) and BHP (LON:), conversely, fell after a stock downgrade by JPMorgan. During the earlier Asian session, equities firmed amid thin volume—as the region heads into Lunar New Year holidays—following a robust on Friday as well as positive statements, over the weekend, from the U.S. Administration on trade negotiations with China. Chinese markets will remain closed all week in observance of the holiday. Hong Kong’s closed at midday, up 0.21 percent. South Korea’s , which ended broadly flat (-0.06 percent), will be closed on Thursday. Australia’s gained 0.48 percent and Japan’s rose 0.46 percent, boosted by the weakest levels since December 28. On Friday, U.S. stocks extended gains thanks to robust labor figures, where moderate did not threaten an inflation spike. A rise in broader prices would impact the Fed’s in interest rates outlook, after Chair Jerome Powell last week that the central bank will be and wait for data to make an informed decision on monetary policy, as well as “flexible” with unloading its spreadsheet. Positive employment data boosted the yield on Treasurys, which had dropped over four straight session on the sudden shift in the Fed’s rate outlook. Yields today extended the rebound, approaching the 2.7 percent level. Upbeat nonfarm payrolls also pushed the higher. 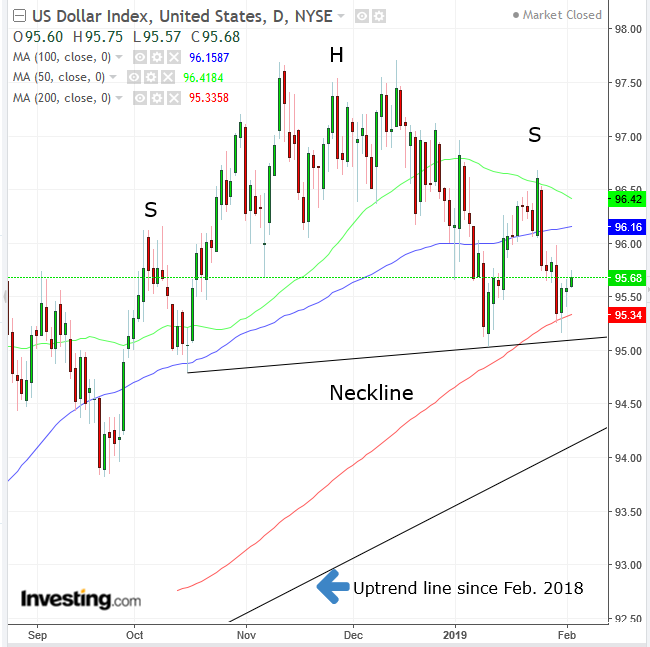 The greenback is now advancing for the third day, after it slipped below the 200 DMA intraday on Thursday. The rebound came upon the potential neckline of a H&S top. Meanwhile, prices moderately extended gains, as bullish traders support the advance from the $52 levels, OPEC supply cuts in January as well as U.S. sanctions against Venezuela. 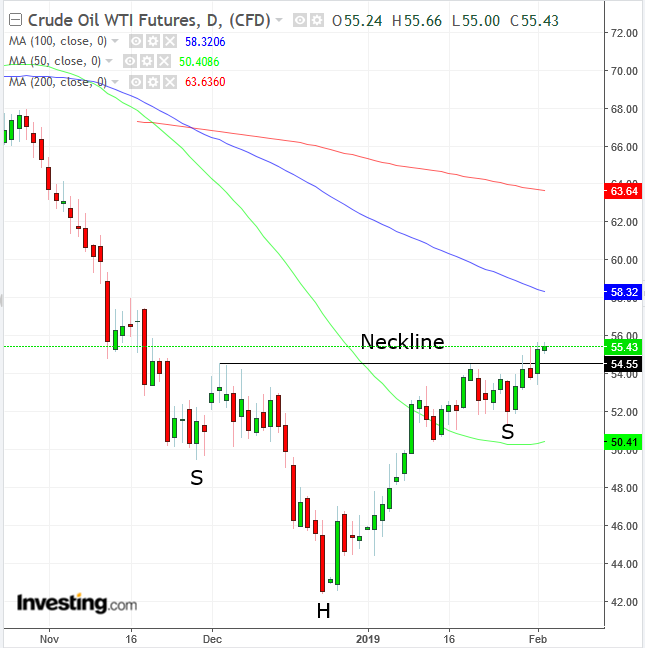 Technically, the price completed a H&S bottom on Friday. However, with just a 1.65 percent penetration of the neckline, there is a reasonable chance of a bull trap. Over the weekend, U.S. President Donald Trump told CBS that trade talks with Beijing are “doing very well” and sounded confident an agreement with North Korea was on the horizon. After a busy few days that included dovish and U.S.-China trade talks in Washington, there’s a notable lack of drivers for markets on Monday, also due to Asian holidays. Investors may look to corporate earnings results—which have so far been a mixed bag—for direction. As to U.S. equities, we have been bearish on the for quite some time, but have recently turned less assertive. The Fed’s tightening pace was the one single headwind that we consistently focused on for stock trend predictions, after historic central bank accommodation resulted in the longest bull market on record. We did say that should the tightening risk be removed, it would turn into a tailwind: last week’s and last month’s market performance confirmed this thesis. However, we do still think that the market has overstated the Fed’s dovish tilt, and this begs for a meaningful downward correction, in the short term. Furthermore, we are also concerned that the market is misinterpreting the Fed’s—and particularly Chair Jerome Powell’s—statements altogether. Powell repeatedly said that the Fed is markedly data dependent, and since there is a lack of available data due to the partial government shutdown, the Fed cannot adequately fine-tune its policy path at present. We would argue that this doesn’t represent a policy shift, as the market keeps claiming. It rather marks a pause on policy decisions. To clarify, we don’t know what the data will show when it becomes available, and it may very well support what the market already thinks, even if prematurely and therefore erroneously, in our opinion. On the other hand, the market might be shocked right back to the brink of a bear market, should it learn that it priced in a dovish turn that never occurred. Not only would it then return to the pre-Christmas levels, but it would price in yet more rate hikes, falling squarely into a full-on bear market. Overall, U.S. shares are up in the short term and down in the medium term. The medium term would reverse if it posts an ascending series of peak and trough prices. Till then, we will maintain our bearish stance. Markets across Asia, including China, Hong Kong, Singapore, Taiwan, South Korea, Malaysia and Vietnam, will close for part or all of this week to mark the start of the Year of the Pig. Donald Trump delivers a delayed State of the Union address on Tuesday. On Tuesday, the Reserve Bank of Australia sets . On Wednesday, Federal Reserve Chairman Jerome Powell hosts a town hall meeting with educators in his first public appearance after last week’s FOMC meeting and . On Thursday, the Bank of England sets and updates its economic forecasts. No change in policy is expected. Also Thursday, the Reserve Bank of India unveils a. Alphabet (NASDAQ:) is slated to release its after market close, with forecasts for EPS at $10.88 and revenues at $38.91 billion, from $9.7 and $32.32 billion respectively the same quarter last year. The tech giant is facing some challenges to its revenue base. Ryanair (NASDAQ:) is scheduled to release today, with EPS expected to fall to $0.02 from $0.45 for the corresponding quarter last year, while revenue is likely to have increased to $1.77 billion, from $1.468 billion last February. Walt Disney (NYSE:) is due to publish its Tuesday after market close, with a $1.54 EPS forecast, down from $1.89; revenue is expected to have edged down to $15.07 billion, from $15.35 billion for the same quarter last year. MetLife (NYSE:) is due to report Wednesday after market close, with an EPS of $1.28, double last year’s number, while revenue is expected to edge down to $15.89 billion from $15.75 for the same quarter last year. Twitter Inc (NYSE:) is scheduled to report Thursday before market open, with an EPS forecast of $0.25 and $868.24 million revenue, compared to $0.14 EPS and $686.06 million last year. Philip Morris (NYSE:) will publish Thursday before market open. EPS is expected to be $1.17, down from 1.27 for the same quarter last year, on $7.39 billion revenues, down from $8.29 billion revenue last year. Hasbro (NASDAQ:) is expected to publish its Friday before market open. Analysts expect an EPS of $1.68, down from last February’s $2.3, and revenues of $1.52 billion, down from $1.716 million for the same quarter last year. The climbed less than 0.05 percent. The Dollar Index rose 0.12 percent, adding 0.35 percent in its third-day rally. The slipped 0.1 percent to $1.1442. The Japanese yen dropped 0.3 percent to 109.85 per dollar, the weakest in more than five weeks. The climbed 0.1 percent to $1.3086. The yield on 10-year Treasuries increased one basis point to 2.70 percent. Germany’s yield climbed less than one basis point to 0.17 percent. Britain’s yield climbed two basis points to 1.268 percent, the biggest increase in more than a week. The spread of Italy’s bonds over Germany’s advanced three basis points to 2.6138 percentage points to the widest in almost three weeks. The climbed less than 0.05 percent to the highest in more than a week. West Texas Intermediate crude advanced 0.4 percent to $55.48 a barrel, the highest in 11 weeks. LME gave up 0.1 percent to $6,131.50 per metric ton. slid 0.4 percent to $1,313.29 an ounce, the largest decrease in more than two weeks.